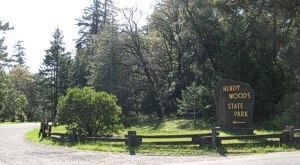 Hendy Woods State Park is located eight miles north of Boonville, and the park entrance is approximately one mile off Highway 128. The eighty-acre Big Hendy Grove is nestled at the end of a short, beautiful drive past the campgrounds. The Gentle Giants All Access Trail (compacted gravel) soon leads visitors into a magical grove of huge ancient redwoods, under whose canopy lives dogwoods, ferns, newts, and awestruck visitors. Three bridges lead travelers over seasonal creeks, and the half-mile trail loops back to the paved roadway. Azalea Campground offers four-handicapped campsites-all with cement pathways, accessible picnic benches and fire pits, and even GFIC electric plugs. Campsites # 5, 37, 40, and 41 are clustered near a new accessible restroom with roll-in showers, and would be ideal for group camping. Van Damme State Park has a sheltered beach that is on a sharp bend directly off Highway One, and is one of the few beaches on the rugged coast that is level with the roadway, allowing visitors to reach the sand feasibly. Accessible restrooms are located at the south end of the parking lot. 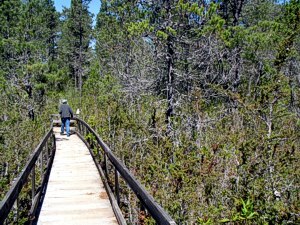 Van Damme also offers a very unique, quarter mile boardwalk through a pygmy forest. Soil conditions and the ocean influence have created a bonsai type forest in close proximity to some of the largest trees in the world. A tree with a quarter-inch trunk could be over sixty years old! The small beach is on Highway 1 opposite the entrance to the campground, and the Pygmy Forest trail is located 2.7 miles up Little River Airport Rd., just south of the park entrance. Point Cabrillo Lighthouse provides visitors with an exceptional, and amazingly accessible taste of the North Coast's history and natural beauty. The 1909 lighthouse and light keepers home have been lovingly restored, and a salt-water aquarium provides a look into the colorful life of a coastal tide pool. The light keepers home is furnished with donated antiques, and the atmosphere takes one back to life on the ocean a century ago. Mobility challenged guests can be dropped off at the entrance to the lighthouse, or take the short paved path from the nearby parking lot. An accessible bed and breakfast is on the hill above the lighthouse, and would offer guests a rare experience of life on the rustic Mendocino Coast. This location is a true treasure, offering visitors a taste of nature, history, and serenity. This park shares the same exit as Pt. Cabrillo Lighthouse, and provides visitors with an exceptional picnic area overlooking Russian Gulch, a peaceful campsite across from accessible restrooms, and a small beach that is level with the parking lot. This location also features a nature trail through the lush canyon, but visitors should evaluate current conditions due to the rough surface of the flat route. At the west end of Main St., where it turns into Heeser, an entrance to convenient and magnificent views is marked by a gap in a white rail fence. While the wide, flat trail is dirt, it curves gradually across the Headlands towards a sea cave with a skylight. The views of the ocean and back towards Mendocino Village provide wonderful photo opportunities. Heavy chain anchors and pilings are remnants of shipping operations that once worked the cove. A short drive northwest leads to large parking lots at the westernmost end of the Headlands, and they provide breathtaking views of the waves, rocks, and sea life that grace the region. 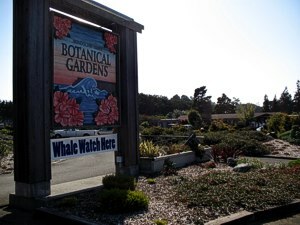 Another North Coast treasure is the forty-seven acre Botanical Gardens, located between the towns of Mendocino and Fort Bragg. Meandering, mostly flat trails wander through this natural gem, containing sections of heath and heather, heritage roses, and dozens of other plants that thrive in the mellow Mediterranean climate. This gem could easily consume the major portion of a day, exploring its artfully landscaped nooks and crannies provide visitors with solitude, astonishment, and creative ideas for home gardens. After a gradual half-mile journey through the gardens and woods, guests experience ocean panoramas from the bluff-top viewpoints. Free Lark scooters are often available, and while picnics are encouraged, consider a light lunch or ice cream at the adjoining Cowlicks. Restrooms are also available. 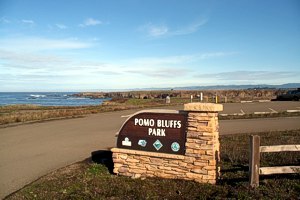 Pomo Bluffs Park sits above the entrance to quaint Noyo Harbor, and provides guests with a birds-eye view of the fishing boats riding the swells in and out of the harbor. Locals have called it Chicken Point, as captains would use its location to determine whether the seas looked safe enough to venture out of the harbor's calm. 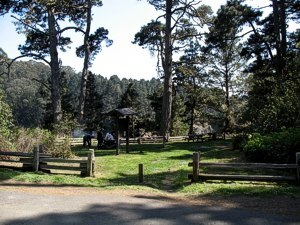 The park has handicapped restrooms, picnic tables, and several asphalt paths landscaped with native plants. To its credit, the park also gives recognition to the land's original Pomo people. To find the park, turn west off Highway One at Ocean View Avenue, fairly close to the junction of Highway 20 and Highway 1. Just south of the Guest House, the historic Union Lumber Company Store beckons with the Mendocino Cookie Company, the Living Light Center, art shops, and a massage center. 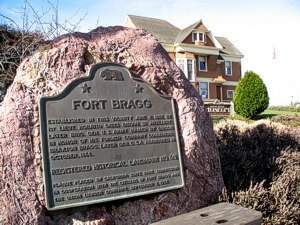 For an excellent dinner, don't miss the quality and charm of Mendo Bistro, located in the upstairs of the Company Store... Click for A Stepless Guide to Fort Bragg Downtown. 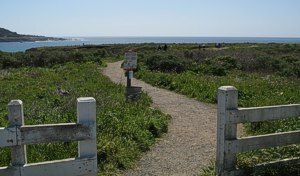 The old log Haul Road, along the northern bluffs of Fort Bragg, is now part of MacKerricher State Park, and can be easily accessed by turning west on Elm St. While the asphalt surface is uneven in places, the bluff trail provides a wonderful spot to watch the sunset, or to see pelicans cruising for some seafood. 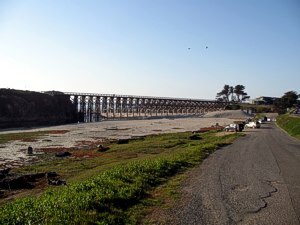 The Pudding Creek railroad trestle has recently been restored, and visitors can cross the historic span while children build sandcastles on the beach below. Another public access is on the other side of the trestle, and while the parking lot is uneven, the convenient route to the haul road may be desirable. McKerricher State Park (707-937-5804) parallels the Pacific from Ten Mile Beach to Pudding Creek, and provides visitors with two Stepless nature trails; one, in need of renovation, is next to a wooded lake, the other is state of the art accessible boardwalk and leads across the headlands to Laguna Point, an ocean's bluffs viewing area. The smooth boardwalk has numerous benches and outlooks that allow for restful breaks to soak in the power of the ocean and the serenity of the meadows. 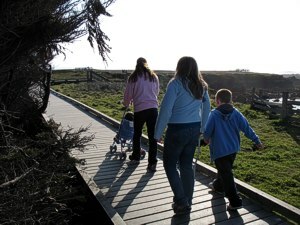 In good weather, the park is perfect for an extended picnic or a visit to the rugged shoreline to watch whales, a sea lion colony, and sea birds. Also consider a loop through the campgrounds to visit local wildlife and fellow travelers. The park has six-handicapped campsites, all are very nice, but my recommendation for maximum convenience to restrooms, privacy, and proximity to nature are either Campsite 27 or Campsite 120.
website content copyright © 2009-2019 Randall Feare, M.S.W.